These are like mashed potatoes inside, and crispier on the outside. Delicious and easy! Dovetailing tip: Cook and additional 8 potatoes. Allow to cool and store in the fridge until Meal 4. You will make the Potato Skins out of these 8. Preheat the oven to 400°F Brush a baking sheet with 1 tablespoon of the oil and sprinkle with salt and pepper. 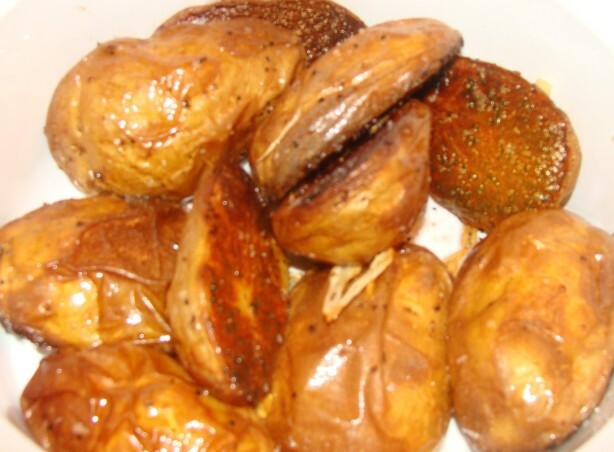 Arrange the gold potatoes on the baking sheet, cut side down, and bake for 45 minutes, or until crisp and golden brown. Transfer the potatoes to a bowl. Heat the remaining 3 tablespoons of oil in a large skillet. Add the garlic and cook over moderately low heat, stirring, until crisp and lightly browned; do not let the garlic get too brown or it will be bitter. Pour the garlic and oil over the potatoes, add the parsley and toss. Season with salt and pepper and serve at once.